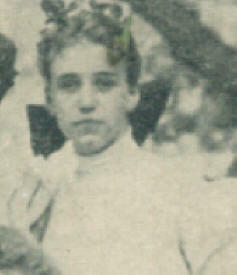 We first meet Katie Mallard in “The Little Colonel at Boarding School,” published in 1903. Katie is one of the gaggle of girls -- including Betty and the Walton sisters, Allison, Kitty and Elise -- who were chums with the Little Colonel. In Chapter IV, we learn that Katie “crochets the cunningest little doll-caps you ever saw.” In Chapter VI, we learn that Katie, like the Walton girls, is a day pupil at Lloydsboro Seminary and therefore, a Lloydsboro Valley resident. In Chapter IX, we learn that she is Kitty Walton’s best friend. Katie receives brief mentions in other Little Colonel stories, too, including “The Little Colonel’s Christmas Vacation,” “The Little Colonel Maid of Honor,” and “The Little Colonel’s Knight Comes Riding.” However, we learn little else about her except that the Mallards attend the same little stone church as the Little Colonel and the Moores and that the Mallard family plays host to several barn dances. Census data shows that there was a Malone family renting dwelling no. 54 in 1900. Eugene Malone, who worked in real estate, and his wife, Mary Ella, had four children at the time: Hale C., born in 1886; Kate E., born in 1892; Alice, born in 1897; and Laura F., born in 1899. Also living with the Malones were two servants, Gabe Johnson and Betty Fible. Their neighbors included the Kayes (dwelling no. 47); the Davis family (dwelling no. 48); the O’Neals at Old Pine Tower (dwelling no. 49); the William Alexander Smiths (dwelling no. 50); the Fultons (dwelling no. 51); and Mary Jackson (dwelling no. 52). We know that the Kayes lived on a farm on the western edge of Pewee Valley off what is now LaGrange Road/Highway 146. Old Pine Tower and the second William Alexander Smith house were located along Railroad Avenue, now Mt. Mercy, west of Central Avenue. Oldham County marriage records show that Eugene B. Malone married Mary Ella Boggs on November 7, 1894 (this date, however, looks as if it should be 1884, based on the ages of the Malones' children.) Their second child, Kate E. Malone, was about a year younger than real-life Little Colonel Hattie Cochran and may quite possibly have been one of her playmates. Mary Ella, or "Minnie Mo" as she was known to friends and neighbors, also made a few cameo appearances in the "Little Colonel" tales as Katie's mother, Mrs. Mallard. In April 1910, the Malone family was listed in the U.S. Census in Gallatin, Tennessee with Eugene’s mother. It’s possible the family was just visiting their Tennessee relations, since both Eugene and Mary Ella were Tennessee natives. By the 1920 U.S. Census, the Malones had returned to Pewee Valley and were renting a place on Central Avenue, near Edgewood, the home of the Craigs. Of their four children – Hale, Kate, Alice and Laura – only Laura, at age 22, was still living with them and her occupation was listed as L&N railroad clerk. By the 1930 census, Laura was living at The Gables with her parents, but had obviously married and had two children: fraternal twins Laura and Herbert McCauley/McCawley (shown in the census as McConley), who were five years old. Pewee Valley Town Historian Virginia Herdt Chaudoin and long-time Pewee resident Iva Barbee Morse both remember those twins, but neither is sure of the spelling of their last name. Kate Malone appears to have married very young. The 1920 census shows a Kate Cobb, born July 24, 1892, living in Graves County, Kentucky. When she married Cecil Cobb on April 21, 1909, she was only 16 and the groom 20. Oddly, her marriage was recorded in Graves County, rather than in Oldham County, where she was from. Cecil Cobb was a farmer and by 1930, the couple had three children, Malone, born 1911; Maurine, born 1913; and Maurice, born 1925. 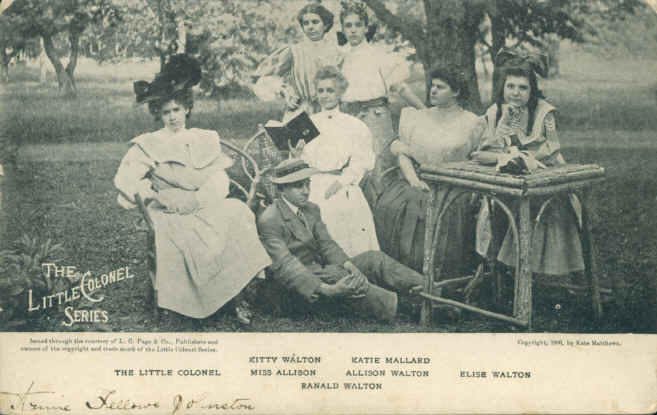 That their oldest boy was named Malone strengthens the possibility that Kate Cobb was indeed the model for Katie Mallard in the "Little Colonel" tales. It was fairly commonplace for children to receive family surnames as first names at the turn of the 20th century. Kate Cobb died in January, 1967, according to Social Security death records. "A friend of mine in Pewee, Alice Malone, became deeply interested in the Fresh Air Home, a sort of summer camp where children from the city slums could come for two or three weeks of life in the country, with good food and out-of-door play, some care and love. We decided to give a "benefit." We would give a piano recital at our house, Virginia (Cary's sister Virginia Hoge San) would sing a couple of solos after we had each played three pieces, then we would each play two more, and wind up with Liszt's Second Rhapsody as a duet. people would make an offering, and Mama would have refreshments. How we did practice!We would do our regular two or three hours a day for our lesson, and then have a joint session at our house and work on the program pieces which were to include Bach's Two and Three-part Inventions, some Chopin, Beethoven, Godard, Mendelssohn, Debussy, etc. The whole community came and were so generous that we had nearly $60.00 to contribute. I think Mama's luscious ice cream and cake were probably more enjoyable than our playing, but they would have come anyway to encourage us in such an earnest philanthropic effort. Eugene B. and Mary E. Malone are buried in Cave Hill Cemetery, Section O, Lot 78, graves 6 and 5 respectively. 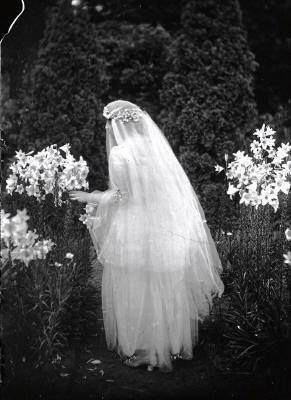 Eugene died in 1931 and Mary Ella in 1947. Buried with them is Mrs. Laura Malone Wedekemper in grave 8 – presumably Laura Malone McCauley/McCawley, who must have remarried after being widowed. She died in 1991. Additional note: "Katie Mallard" is one of our best examples of why it is not possible to trust early newspaper articles about the “Little Colonel” stories, even when those stories quote many of the other character models for the books, such as Mary G Johnston or even the Little Colonel, Hattie Cochran, when it comes to the subject of who's real and who's fictional. Even Annie Fellows Johnston could be elusive on the subject in her "official" writings, including her autobiography. However, in this case, because of a rare piece of ephemera where Annie writes in her own hand the identity of Katie Mallard, we had proof of the character's "realness" and our only clue to start...a name. By the newspaper accounts and other printed and (auto)biographical sources, Katie Mallard should have just been another on a list of many fictional characters. That list is growing shorter all the time.